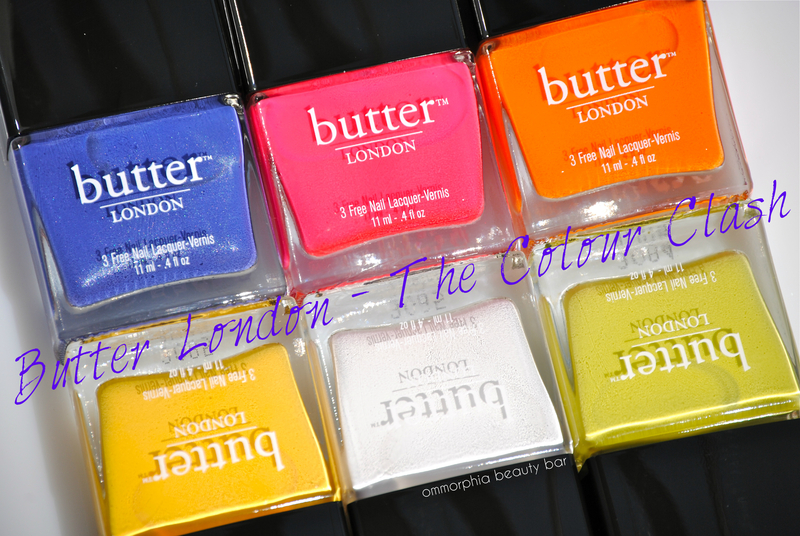 For Fall 2013, Butter London has decided to take a very untraditional turn and create ‘The Colour Clash Collection’ – a set of 6 brightly vivid shades that might seem more suited for warm, rather than cooler temperatures … and will definitely stir up quite a bit of conversation. While I always personally look forward to the more sombre hues Fall collections have to offer (and as I’m currently on holiday – at the beach, mind you – and have absolutely ZERO desire to even think of anything cold-related), I can’t deny the appeal of these colours; to me, they feel like I’d be extending the Summer season. But that’s just me. Last word: Confused by the shade choices? 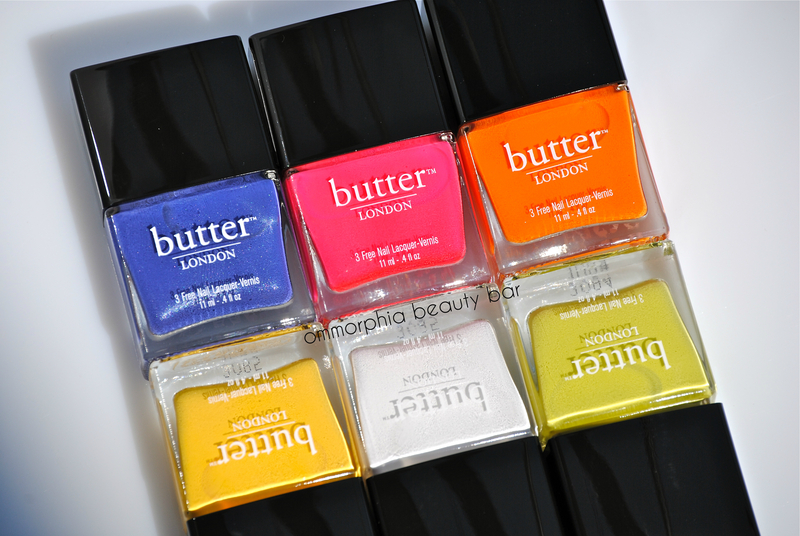 You’re not alone, and while my initial reaction was more along the lines of “what was Butter London thinking?”, I’ve come to appreciate the sly humour behind this collection. 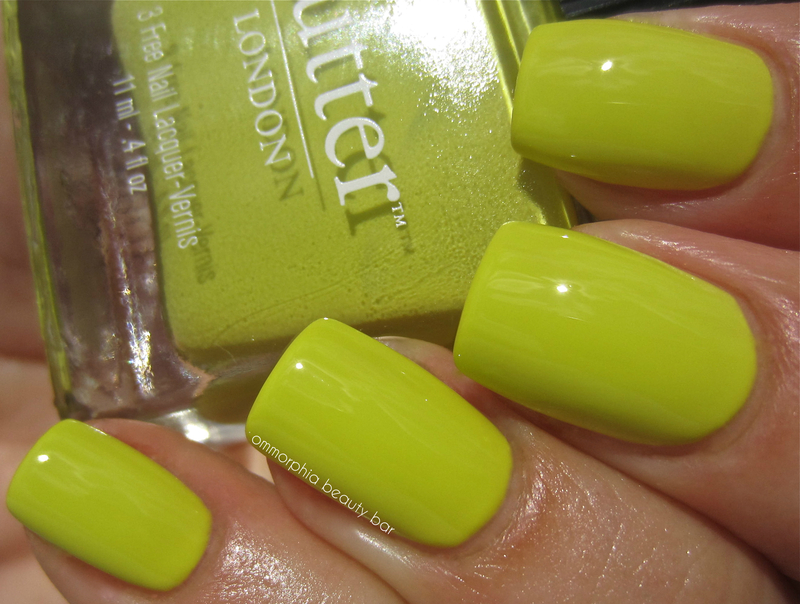 It doesn’t hurt either, that the formula is in true Butter London style: perfect. While I can’t say I’m much of a yellow or lime fan, I did like the way both ‘Pimms’ and ‘Wellies’ looked on me, but my hands-down favourites are ‘Cotton Buds’ (again, my white obsession), ‘Silly Billy’ (I also really like saying the name), and ‘Giddy Kipper’. 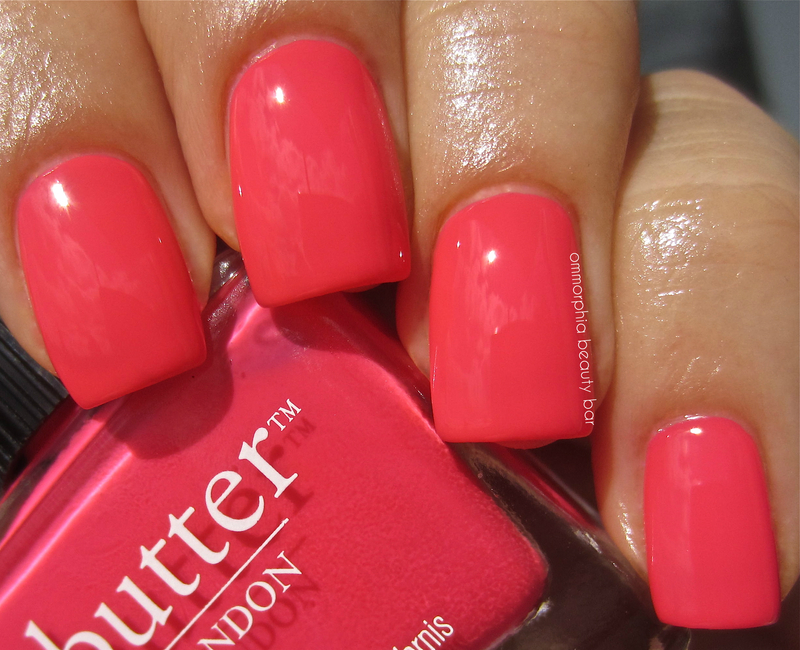 As to ‘Cake-Hole’, I’ve been loving wearing this as a pedi shade — looks awesome on the beach! Available now, The Colour Clash Collection retails for CAD $17.00 11 ml/USD $15.00 4 fl.oz – each, with a special promo of CAD $85.00 for the set (Canadian website only). I neeeed the white one. Its hard to find a good white polish. 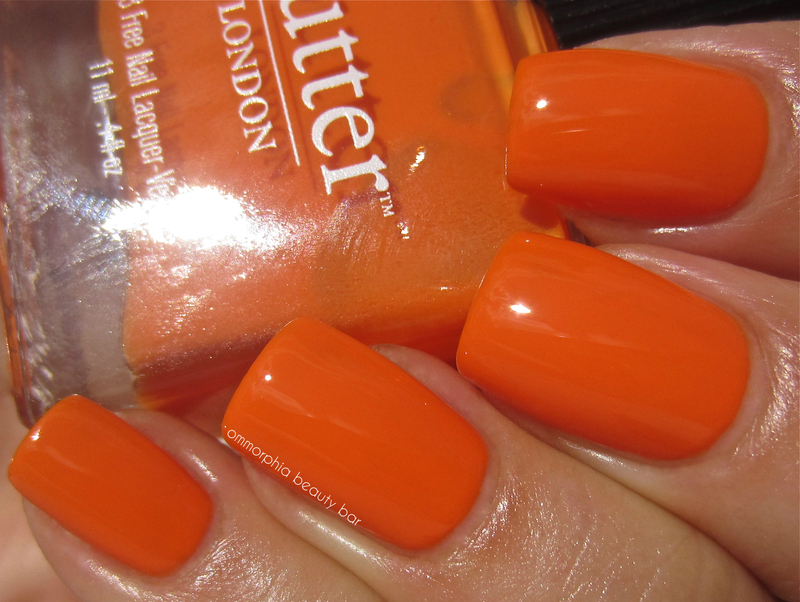 I had a Sally Hansen one and it was soo streaky. It’s a beautiful white – very pigmented and non-streaky! Is Essie’s The More the Merrier a dupe for Wellies? 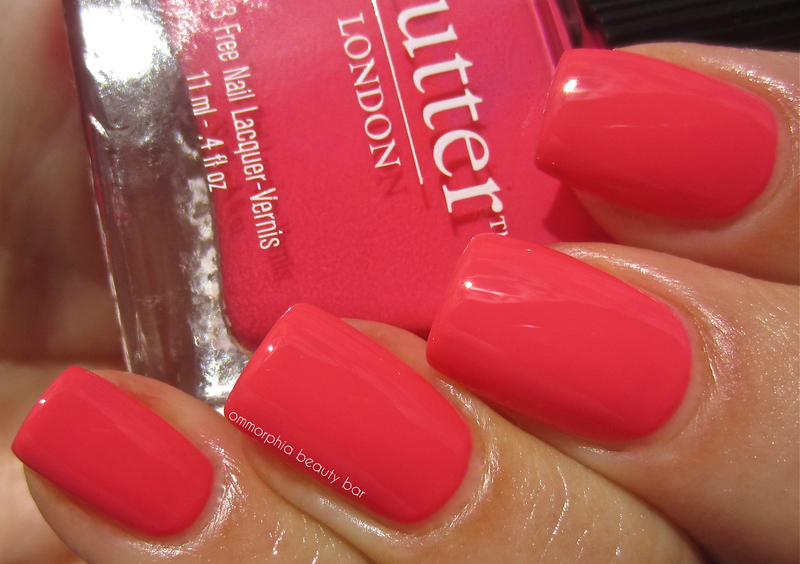 and for Cake-Hole, are there any dupes, or similar colors? I wish I could help you out, but as I’m on holiday now without access to my personal stash, I couldn’t say for sure…the best I can suggest is to look at other swatches of the shades you mentioned on my blog — my photos are high resolution and show the colours true. Hope that helps a bit! Thanks so much! 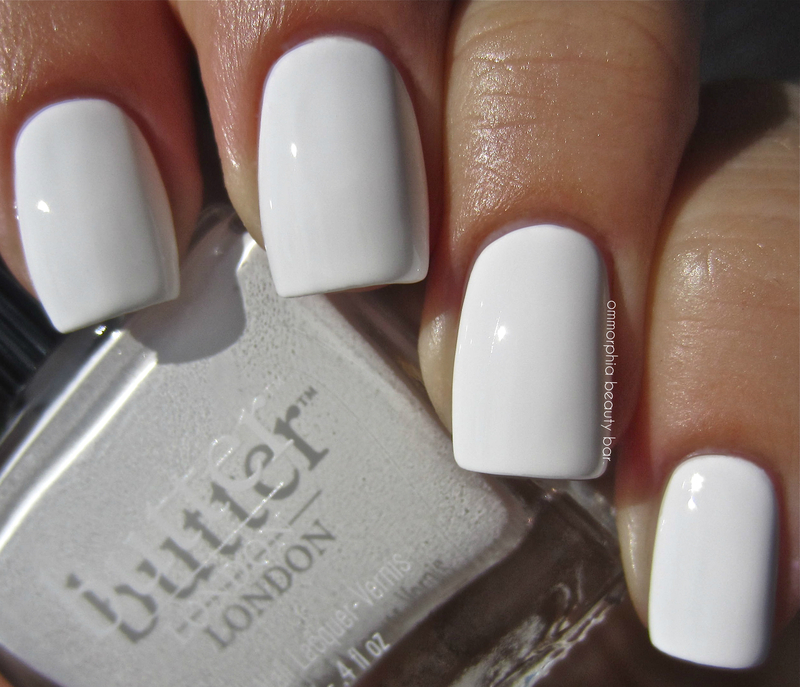 And yes…one can never have too many white polishes! 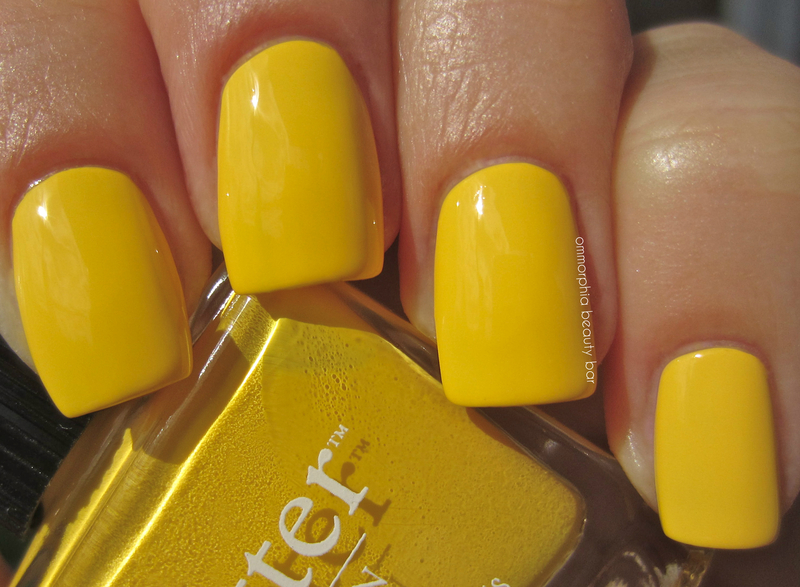 🙂 I never was a fan of yellow lacquers before, but this one just makes me happy looking at it! I cannot WAIT to try these out myself! They all look so pretty! 🙂 I love white too, and love Cotton Buds and Cake-Hole on you, Eugenia! Awww…thanks, Aire! I can’t wait to see these on you too — I have no doubt they’ll look spectacular, especially with your gorgeous nails! Aw thank you! Look who’s talking! Will share a post soon. 🙂 Enjoy your southern escape! Thanks, Sayo and you’re welcome! I’ll be sure to look into any comparisons when I return from my vacation! Thanks for beautiful swatches Eugenia. I love this collection, and wish I could buy them now as I’m really into summer this year, and would love to wear every one of them! If I get them in the fall, will I just put them in my stash for next year, and then, I hate to admit it, forget all about them by next July? 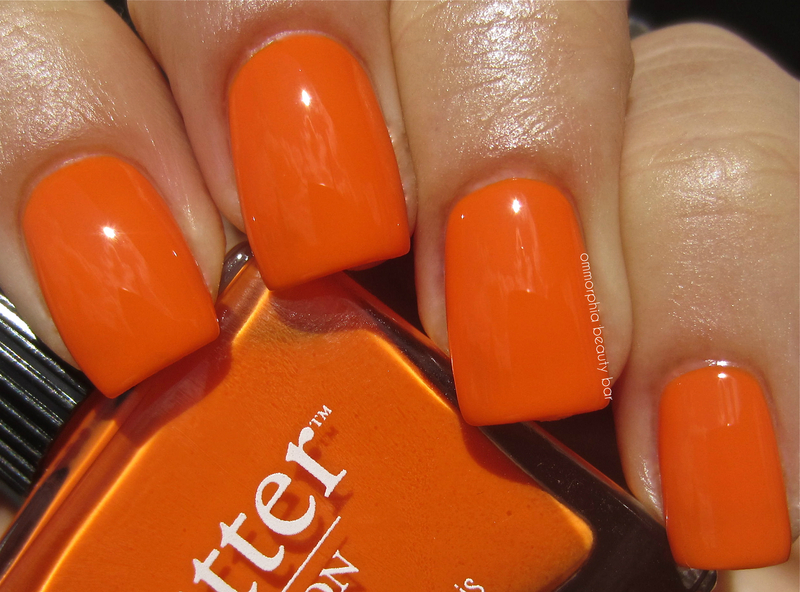 For some reason, when it comes to nail polish, I have a very short memory! I hope you’re enjoying your holidays!! Thanks, Nancy – I’m having a wonderful time … holidays away always recharge me! 🙂 As to your feelings regarding polishes, you’re not alone; anyone who loves painting their nails suffers from the same addiction, lol! Too funny that this collection vs the summer collection seem like they should be switched! Pretty nonetheless! xoxox Hope your vaca is awesome! Thanks, my friend! It’s been a hectic few weeks, let me tell you! As to the collections, it’s true — they do seem switched around, but I think that makes them all the more fun for that! Bear in mind that I’m on holiday at the moment with no access to my lacquer collection, but I did swatch the two quickly side by side and found the CHANEL to be a softer white in comparison, while the BL had not only more brightness, but a slightly thicker formula as well. Still, both are absolutely gorgeous whites! Obviously, Cake Hole is a shade after my own heart! I have so many similar shades already…but what’s one more, eh? LOL. And of course, Giddy Kipper is a beaut! I haven’t been buying many blues lately – I think I exhausted myself a while ago on blue – but this may rev me up again. Truth be told, I love the way every single one of these look Eugenia – I could own the whole collection and be 100% satisfied! Awww….glad you like them, Toya! With your gorgeous skin tone, every single one of these babies will look amazing! Glad to hear that this collection is firing you up again! awesome review and swatches. exactly what i’ve been looking for! what light did you photo the swatches in? They all look so beautiful!!! I especially like the yellow, like you said, for being non-juvenile looking. I don’t own many yellow shades, and I’m happy to see that this one is totally different from the others in my stash — Pimms is such a happy, happy shade! 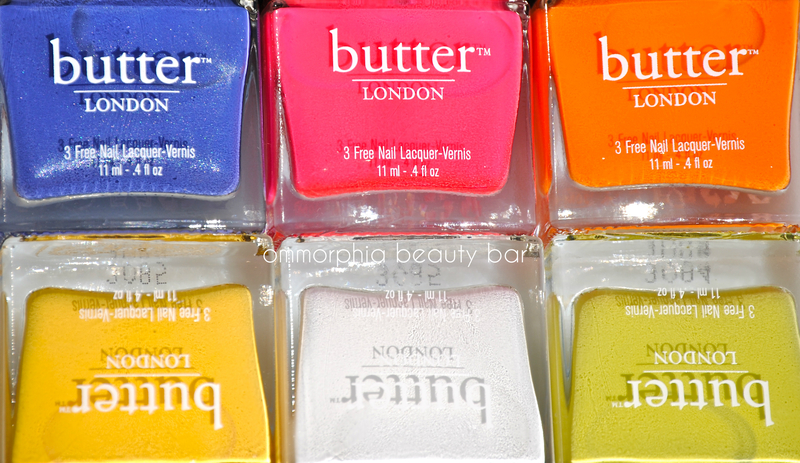 Some of the Butter London summer shades felt a little fall to me so this is kind of a fun reversal. I really like Wellies and I like Cake-Hole mostly for the name, haha. 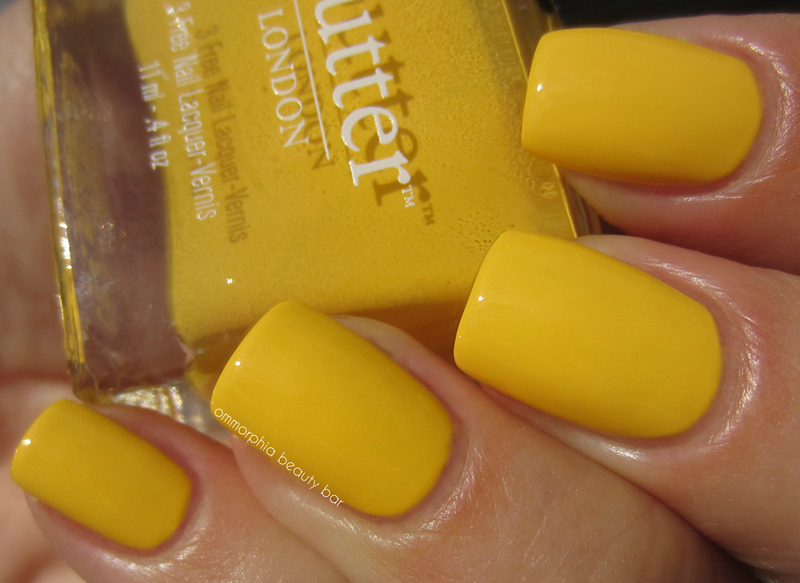 A lot of people felt that way, as though Butter London somehow reversed the seasons, lol! That being said, it’s nice having exciting options for Fall, as opposed to the same old, same old! Blue-lover, that’s me 😛 I think that and surprisingly Cake-Hole are the ones that catch my eye from this collection, but they are all so fun! I love it. That’s IT exactly: this is a totally fun collection and so surprising for the season! Hmm, I’m not so sure about these colors for fall. Will definitely clash with clothing. These look beautiful on your nails! Do you know how similar in color Giddy Kipper is with Essie in Smooth Sailing? Thanks, Jennifer! Unfortunately, I’m on holiday right now and don’t have access to my polish collection to give you an accurate perspective, but in looking over swatches of Essie’s Smooth Sailing I had previously posted on my blog, I can tell you that Giddy Kipper is much deeper in tone and with a more prismatic shimmer than the Essie. Hope that helps! I was wondering the same thing–Essie Smooth Sailing and also China Glaze Fancy Pants….? 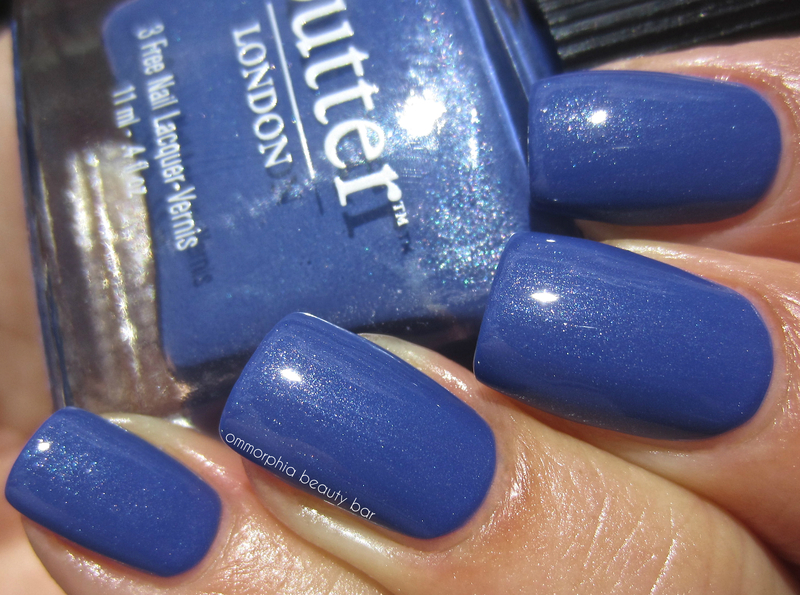 Giddy Kipper looks so beautiful but my collection has gotten so large I just can’t spend money on another dupe! As far as dupes go, the BL is nothing like the Essie; but as I’ve mentioned to a few other readers, I don’t have full access to my stash at the moment and I couldn’t tell you of the exact differences between the BL and the CG. In the end, it also depends on which formula you prefer, as well as budget – with the CG being on the lower end of the scale, the Essie in the middle, and the BL at the top.